"In a world filled with never-ending conflict and bad news, it's no surprise that many people want to stick their heads in the sand this summer" says Katia Hetter, Writer/Producer, CNN Digital. CNN asked the Amazon Books editors about their favorite new books that inspire, build bridges, cross borders and bring joy. Here are their 10 picks for the summer of 2018 and the reasons why they chose these books. But I can't stop thinking about the injustices that have been dominating the news cycle. That's why I'm reading Bryan Stevenson's argument connecting the US history of slavery through segregation to mass incarceration, "Just Mercy." He lays out his case about the reasons to confront this brutal history. Denying it, he argues, hurts everyone, no matter your color or race or nationality. I'm also brought back to Ron Chernow's "Alexander Hamilton," the biography of the Founding Father that inspired Lin-Manuel Miranda -- who was reading it on a beach vacation -- to write his award-winning musical. "A civic lesson from a slaver," says Miranda's Hamilton, calling out Thomas Jefferson in the musical. "Hey neighbor, your debts are paid cuz you don't pay for labor." 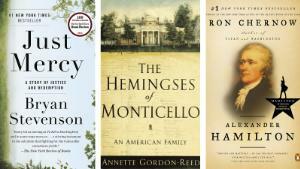 "The Hemingses of Monticello: An American Family" by Annette Gordon-Reed is also on my stack of summer books, as I attempt to work through the contradictions of the man who wrote "Life, liberty and the pursuit of happiness" while enslaving people. Is that too heavy for summer? Rather than ignore the unrelenting and brutal news of the day, here's another idea for your summer reading list. Focus on books that explore other people and cultures, teach kindness and bring hope. Address the issues that trouble your mind and heart, whether they're ripped from the headlines or part of your everyday world. "I think truly that every good book helps us to see, to imagine our way into someone else's heart, and to see our own heart more clearly," says Newbery Award-winning children's author Kate DiCamillo, whose children's books include "Because of Winn-Dixie," "Raymie Nightingale" and "Mercy Watson to the Rescue." With those themes in mind, here are recommendations -- new works and classics alike -- to give hope, build bridges, cross borders and inspire.